Hey William Barr, what are you going to do now? 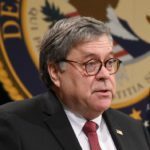 Donald Trump’s handpicked Attorney General William Barr was finally forced to face questions today about the cartoonishly pro-Trump “summary” he released of the still secret Mueller report. When Barr faced those questions today during an officially unrelated House Appropriations Committee hearing, he generally tried to deflect them. But the answers he did provide, and even his refusal to answer some seemingly easy questions, may have given some things away about his upcoming strategy. For instance, William Barr said that he’s sticking with his plan of releasing a redacted version of the Mueller report within the next week. Based on his existing track record of dishonesty toward the Mueller report, one can expect that his redactions will be far broader than necessary, and will attempt to hide the very worst things that the report says about Trump. The big question is just how far he’s going to take his disingenuous redactions. For instance, Barr can redact everything that’s even remotely bad for Trump, but that would likely backfire. It would create far louder public support for unearthing the entire report, and it could hand House Democrats greater legal leverage in their battle to obtain the entire report forcibly by subpoena. On the other hand, Barr can only redact the things that are the very worst for Trump, while exposing a number of Mueller’s findings that are moderately bad for Trump, in the hope that this might be enough to put the entire thing to bed. Of course Barr is likely to do whatever is going to make Donald Trump the happiest in the short term, as opposed to what might help Trump the most in the long run. So it’s a big deal that Barr refused to answer when asked today whether he’s discussed the Mueller report with Trump and his team. Previously, Barr’s own people had been claiming through the media that Barr had not discussed the report with Trump. Now, under oath, Barr was suddenly unwilling to give that same answer. You’re free to interpret whether you think this means that William Barr has discussed the Mueller report with Donald Trump, and he refused to answer today because he didn’t want to get nailed for perjury, or whether you think Barr had some other reason for not answering. If Barr has discussed the redactions with Trump, Barr could be setting himself up for eventual obstruction of justice charges; it would be similar to what Richard Nixon’s Attorney General John Mitchell ended up in prison for.